The last two unscheduled outages of the Guemes have been due to failure of the vessels outdrives. The second failure resulted in the boat being towed to Seattle’s Foss Shipyard due to unavailability of haul-out space at more local shipyards including those in Bellingham, Anacortes and Everett. These unscheduled outages come as no surprise when looking into the history of these drives originally fitted to the boat in 1990. According to the Elliot Bay Design Group’s (EBDG) M/V Guemes Ferry Replacement Plan published November 22, 2013, the vessel propulsion is made up of two Cummins KTA 19-M3 engines delivering 530 horsepower at 1800 rpm. “Each engine drives a ZF 550 hydraulic transmission connected to an Ulstein DF-370 azimuthing thruster. . .” p.15. The problem is that these drives “. . . are now obsolete and no longer supported by the manufacturer. It is difficult to locate bearings and replacement parts must be custom made. There are chronic issues plaguing the drive seals requiring maintenance every two years.” p.15. The ferry committee, working with the late Tim Rosenhan, had noted the chronic problems with these drives and presented the table below to Public Works in 2014. 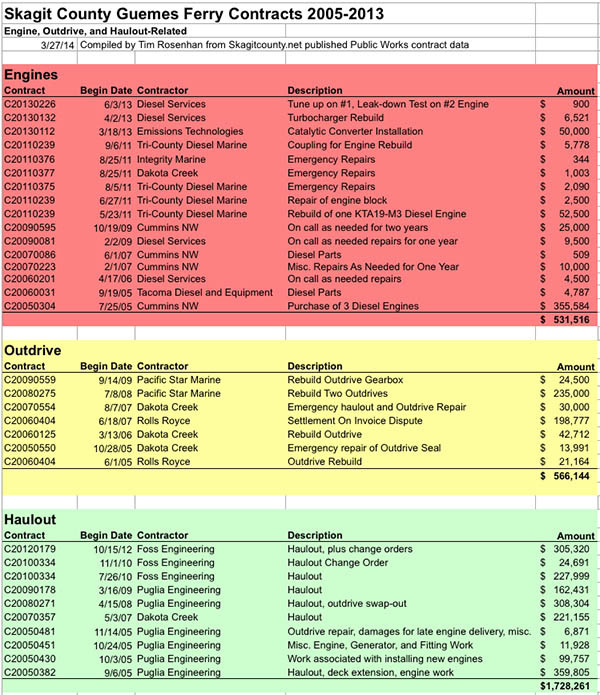 The table compares the cost of the repair and maintenance of the drives in a period from 2005 to 2013 to the cost of maintaining the diesel engines including buying the three new Cummins Diesels in 2005. As can be seen, the cost to maintain these Ulstein drives at $566,144 was more than the maintenance and replacement of the diesels at $531,516. This data was presented to Public Works several times over the next years, the last time when the current director of Public Works, Dan Berentson, took his position. At this last presentation, the Ferry Committee was told that all the problems with the drives had been solved by working closely with Rolls-Royce who had picked up this product line when Ulstein had gone out of business. The Ferry Committee’s position was that new updated outdrives should be purchased, especially as advances in the technology allowed drive service without dry-docking the boat. The problems with the outdrives have continued. To date, the County has chosen not to purchase new outdrives.